Quibbling with the completeness of Sir John Eliot Gardiner’s Cantata Pilgrimage is a touch academic, as almost all the sacred cantatas were performed in that breathtaking achievement over the course of 2000. If logistics conspired then against an oeuvre intégrale, SDG is gradually filling the empty spaces, initially with a fine disc of Ascension cantatas (7/13) and now with a refashioned Actus tragicus (after the previous DG Archiv release – 5/91, 7/00 – which was not part of the Pilgrimage) and a Bach debut for Gardiner, the Easter Oratorio. The Actus tragicus sits on that captivating cusp of two worlds: Bach the inheritor of the richly theological and devotional 17th-century ‘vocal concerto’ and Bach the young 22-year-old, modernising, refining and – even within these intricate funereal strains – strutting his stuff. Such is also the case with Gardiner and his trusty colleagues, who collectively push back from the idea that ars moriendi (the art of dying as a much-loved Lutheran conceit of fear and consolation) needs be world-weary and soporific. Some may find the opening chorus, initially at least, too fleet of foot and chipper but this soon transforms into a performance with a telling theatrical and atmospheric ‘thread’ – graphically reflected in the splendid recorder-playing of Rachel Beckett. The coro ed arioso ‘Es ist der alte Bund’ has often been the downfall of the director and ensemble who fail to recognise the dramatic pacing and ‘tilt’ in the music as we move almost imperceptibly from despair to reconciliation. Gardiner toys delectably with Bach’s meticulously textured dissonances; the soft hue of recorders and gambas presents an other-world of irradiating mercurial elusiveness, whose sound perspective here is skilfully engineered. It all leads to eventual roulades of faith-inspired hope, perhaps a touch over-exaggerated in diction; but this is, as you expect with Gardiner, a performance of supreme devotion and attention to detail. 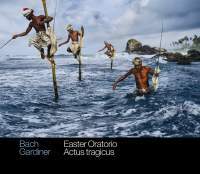 The Easter Oratorio could not provide a greater contrast. After the knotty rhetoric of BWV106, this work – presented here in its final manifestation during Bach’s last few years – shines forth without many long shadows. There is the customary razzle and dazzle from the virtuoso Monteverdi Choir and English Baroque Soloists, though it’s the oboe solo in the Adagio which, in the opening triptych, lifts the music from the page most persuasively. The arias, even without universally distinguished performances, contribute to an overall shape which compels one to regard this piece as rather more than a pragmatic patchwork quilt. Gardiner is clearly convinced of its merits and therefore you’ll find no greater advocate. Now all we need are the occasional sacred cantatas Nos 29, 119, 120, 157, 195, 196 and 197 to complete this mighty project.